When I first made these and got a whiff of them cooking in the oven, it seriously smelled like any game day snack that you’d find in a sports bar or at any party. My mouth was water the second they came out of the oven! The smell, the texture, and the nostalgic feel that I was eating chicken nuggets make these little dudes the perfect healthy comfort food. 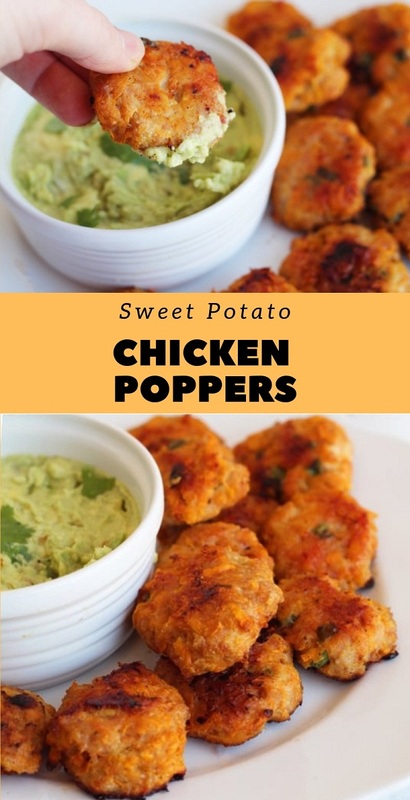 Seriously, it makes these a great dish to bring along to your upcoming party, or super bowl Sunday gathering to ensure that you have something healthy to eat for yourself, while still having something delicious to share. Don’t be that guy that brings kale chips… be the guy that brings sweet potato chicken poppers.